1. 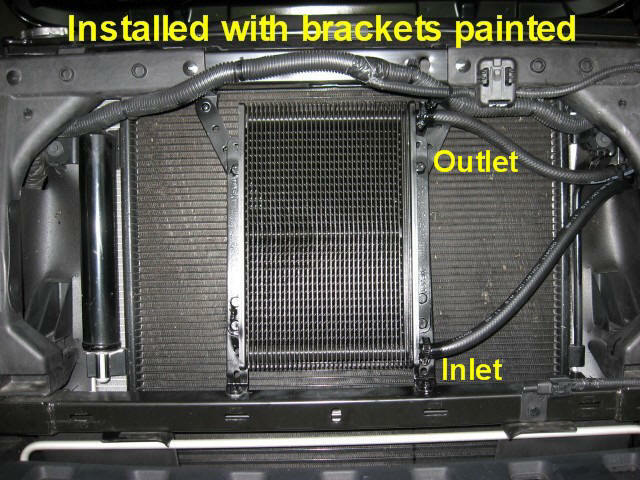 Install cooler with supplied brackets. The JK Wrangler has two plastic mounting tabs on top of the radiator area. Use these two tabs for the top mounting brackets. You will need to bend the tips of the lower brackets and drill two holes to secure the lower brackets. I used stainless steel, self-taping screws with spring lock washers on the lower brackets. 4. Use black spray paint to paint brackets and clamps for a factory-installed look. Position a rag or cardboard behind brackets to avoid spraying the radiator with paint. 5. 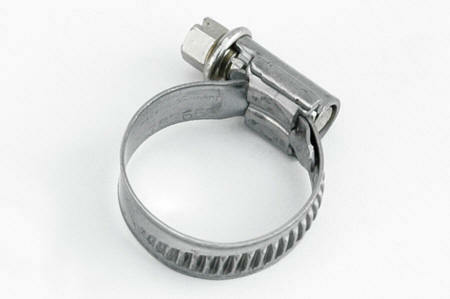 Purchase 2, 3/8" barbed to barbed brass fittings, and 2 extra radiator hose clamps suitable in size for the coolant hose. Available at your local hardware store or home center type store. 6. 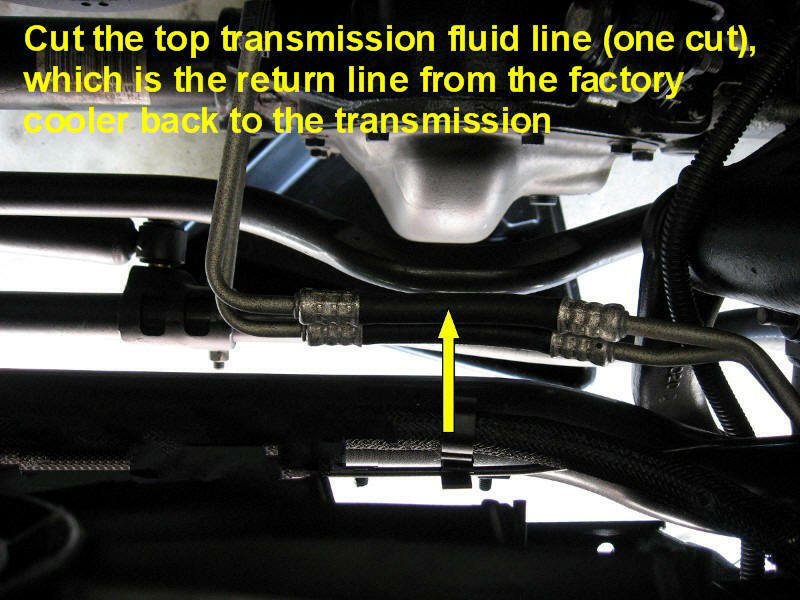 Determine which transmission line is the "return" line from the factory cooler/radiator, returning to the transmission. On the 2011 JK Wrangler, it is the top line as shown. To double check, start the engine, and within 30 or 40 seconds, while the engine is running, feel both metal transmission lines. The hottest line is the line going into the factory cooler/radiator, from the transmission. 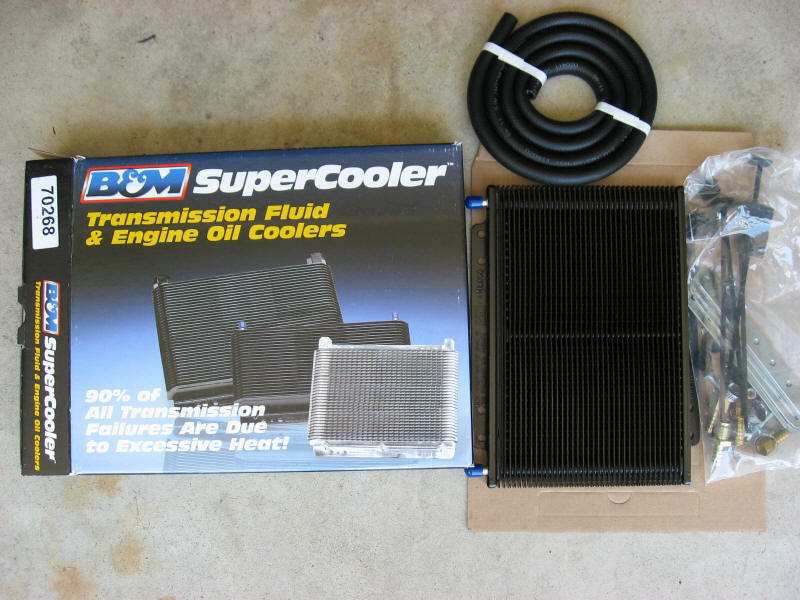 The line that is cooler, is the return line from the factory cooler/radiator, back to the transmission. 7. Place a few rags under the rubber portion of the transmission lines, and cut the return line only, in the middle of the rubber. Very little transmission fluid will come out. Probably less than 1/4 cup or so. 9. Wet one barbed fitting on both ends with transmission fluid, and insert the barbed fitting into SuperCooler hose, then into the factory hose. Tighten radiator hose clamps snugly. 11. 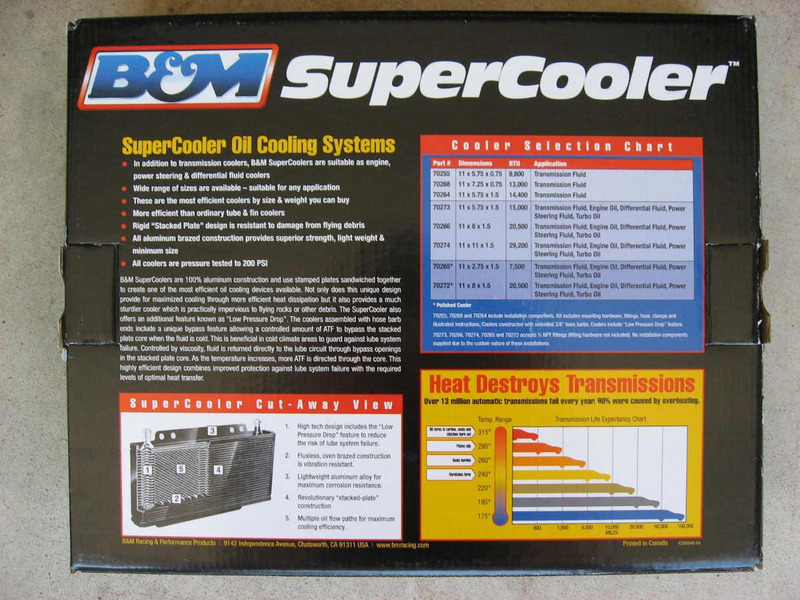 When mounting the B&M SuperCooler in the side inlet/outlet position, the bottom fitting of the SuperCooler is the inlet, coming from the factory radiator, into the SuperCooler. 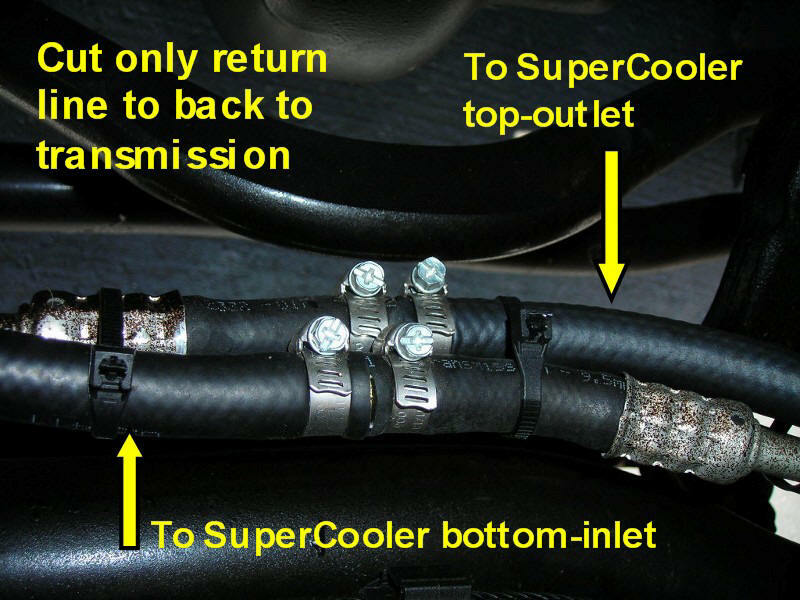 The top SuperCooler fitting is the outlet, returning fluid back to the transmission. 12. Double check all bolts and clamps for tightness. 14. Start engine and run in neutral for a couple of minutes. Check your transmission dipstick while the engine is running. You will need to add a little ATF-4 transmission fluid. ATF-4 is the ONLY automatic transmission fluid recommended by Chrysler/Jeep for the Wrangler. I had to add less than 1/2 quart or so. 15. 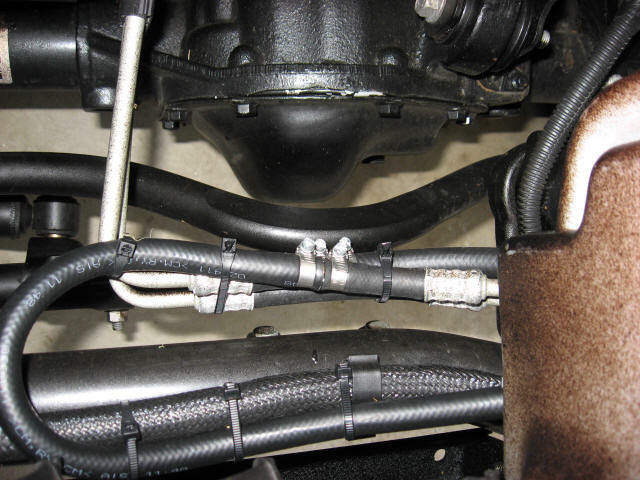 Double check all hose connections for leaks after engine is fully warmed up. Drive a few miles, then check your dipstick transmission fluid level again while the engine is hot and running. Add fluid if needed to bring it up the "hot" area on the dipstick.